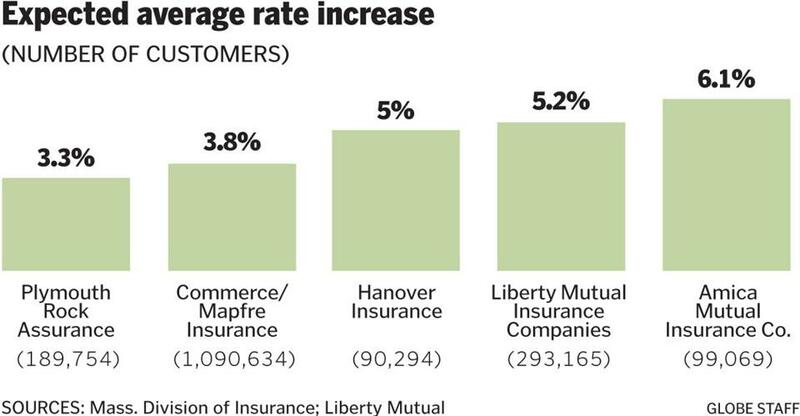 Some of the largest auto insurers in Massachusetts have received approval from state regulators to raise their rates on average by between 3 and 6 percent this year, with some drivers likely to see even higher increases. The rate increases will probably affect all customers of those companies, industry officials said. This is the second straight year of steep increases: Rates in 2016 jumped between 6 to 9 percent, on average. 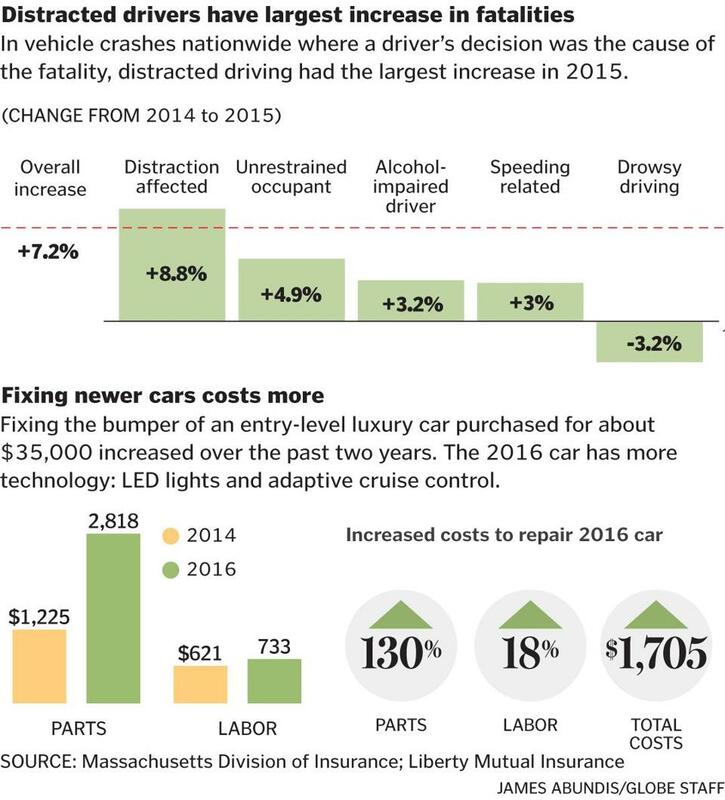 The average premium paid by Massachusetts drivers was $1,108 in 2014, the most recent data available. Nancy James, an independent insurance agent in Concord, said she started the year by warning clients they are likely to see bigger bills this year, some as much as 10 percent higher. The National Highway Traffic Safety Administration said fatalities attributed to distracted driving, which includes texting, fiddling with GPS, even eating, increased by 8.8 percent in 2015, the latest year available. Those incidents helped reverse a long-running decline in automobile-related fatality rates. In 2015, the overall number of motor vehicle fatalities in the United States increased 7.2 percent, the largest jump in half a century. The Massachusetts Division of Insurance, which reviews rate requests to ensure they are justifiable, said it has noticed companies reporting higher property damage claims. Other factors are also driving rates up, particularly the increasing amount of technology packed into cars these days, such as sensors that monitor and measure nearly every aspect of performance. Just fixing a damaged bumper cost $1,705 more in 2016 than it did two years earlier, according to Boston-based Liberty Mutual. A simple windshield replacement that used to cost about $350, now involves higher-quality glass and connections to the car’s sensors, and costs twice as much, said Joe Salerno, vice president of claims at Quincy-based Arbella Insurance Group. He also pointed out that more cars are made from aluminum, instead of steel, bodies; that softer material requires more-expert mechanics to repair. Manufacturers are also bringing the sophisticated safety features that once came only in luxury lines, such as systems that keep motorists from veering into another lane, into everyday models. But Salerno said those new technologies have not yet come into wide enough use to help improve traffic safety. Automobile coverage, which used to be a reliable profit-maker for insurance companies, has become far less so in recent years, with more drivers on the road texting, talking, and plugging directions into their phones. The bottom line: Many insurance company profits have taken a whack. Illinois-based State Farm Mutual Automobile Insurance Co., the country’s largest auto and home insurer, recently disclosed that its profits for 2016 plummeted to $400 million from $6.2 billion the previous year, due to auto accident claims. The Travelers Companies Inc. reported earlier this year that car insurance claims for 2016 were nearly 840,000, an 11 percent increase from the prior year. Travelers said it is now considering rate increases. What will self-driving cars mean for insurers? Fernandes can be reached at deirdre.fernandes@globe.com.